Friend of Tamarkin Camera, Gordon V. Smith, shares his color photographs. This is the second of two articles that photographically describe my visit to Cuba in February of 2017. The first of these (“QUBA STREETS”) appeared here, and was centered around street photography and the folks that I met and saw during this 700 mile trip from Santiago to Havana and beyond. Those photographs were in monochrome, which I feel is appropriate for street photography where the objective is to portray people as they go about their lives and to convey an impression of what those lives are about. These images are a selection from slightly over 2,500 DNG format photographs that I took over a nine-day period. I carried an M 240 and a Q TYP 116. All of those included here were from my Q and nearly all were at the 28mm focal length. Obviously these are more studied photo situations than the often impromptu opportunities of street photography. Even so, I nearly always employed the auto-focus feature and I found it to be very reliable, even when shooting through a window. 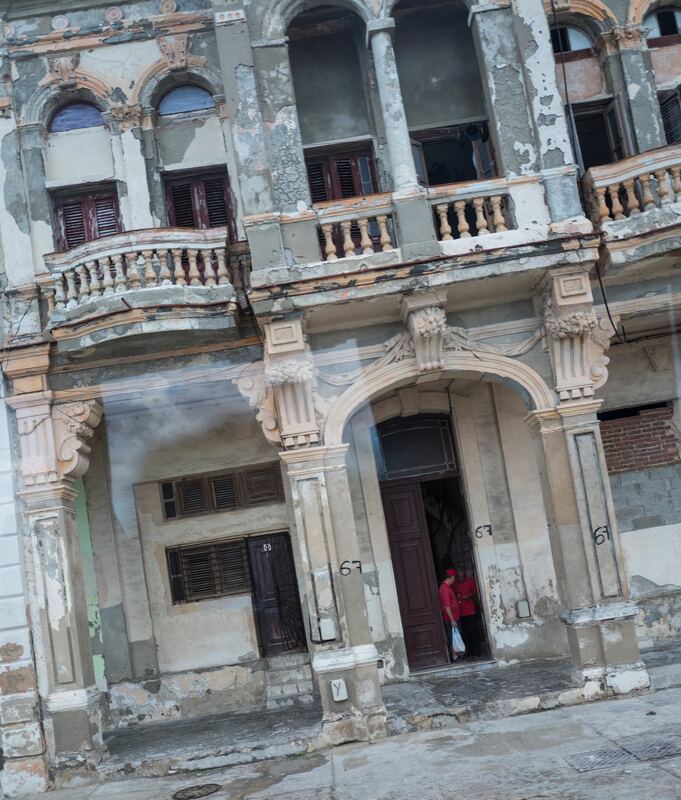 Cuba is hot and humid, and air conditioning is not ubiquitous. My Billingham Hadley bag was great, as usual, for transporting my photographic impedimenta from place to place. But it was too uncomfortable for wandering the streets on foot. So I ended up with the day’s camera on my shoulder and full pockets. I vowed to obtain a light “day-bag” for these conditions. In the previous article, I characterized the nature of a place by separating its people from the environment, buildings, monuments, and the political and economic systems that may prevail. I likened these features of a place to a stage, contrasted with the people who form the acting company. I also briefly described Cuba’s history, which is very complex and how some knowledge of it helps to understand what I experienced and what I saw and photographed. In this second part of my Cuban story I focus on the stage, i.e. 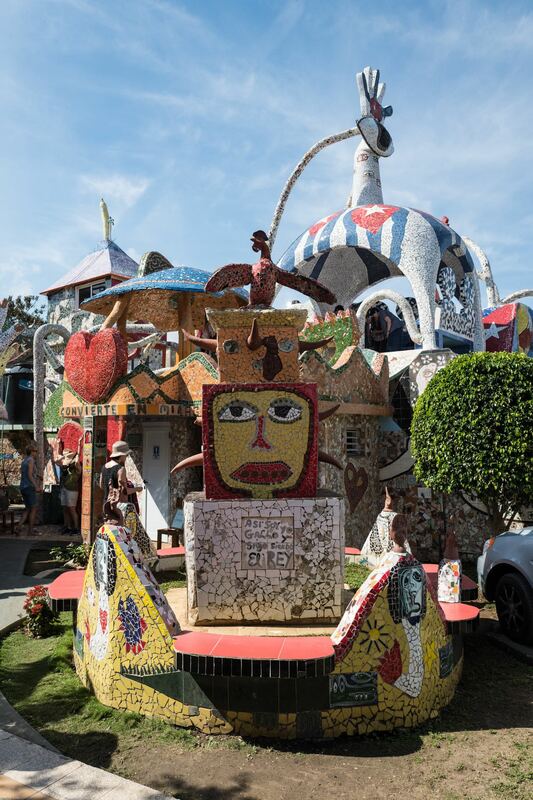 the environment, buildings, monuments, and other inanimate characteristics of the place. I did not include images of the landscape, which is very attractive and similar to other Caribbean locales. I concentrated more on infrastructure, much of which is reminiscent of an earlier time, and some other distinctive aspects of this country. 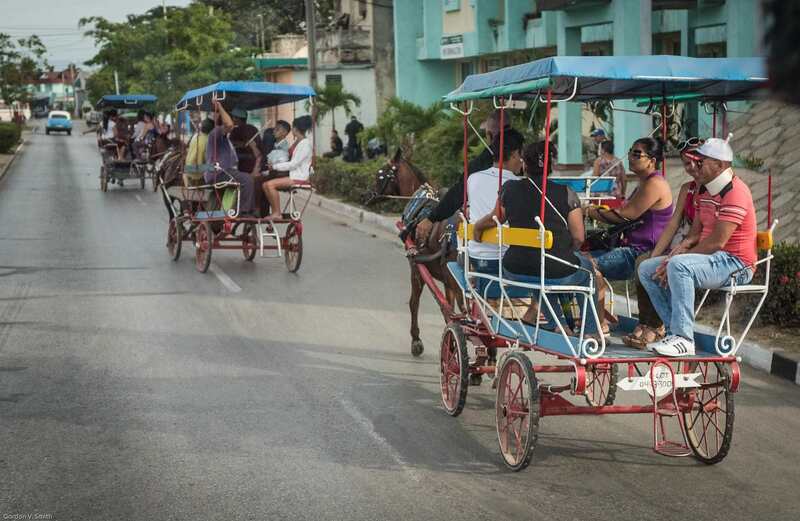 Given Cuban history, I expected to experience a strong feeling of its Spanish heritage. That is best portrayed photographically in the architecture of its cities. 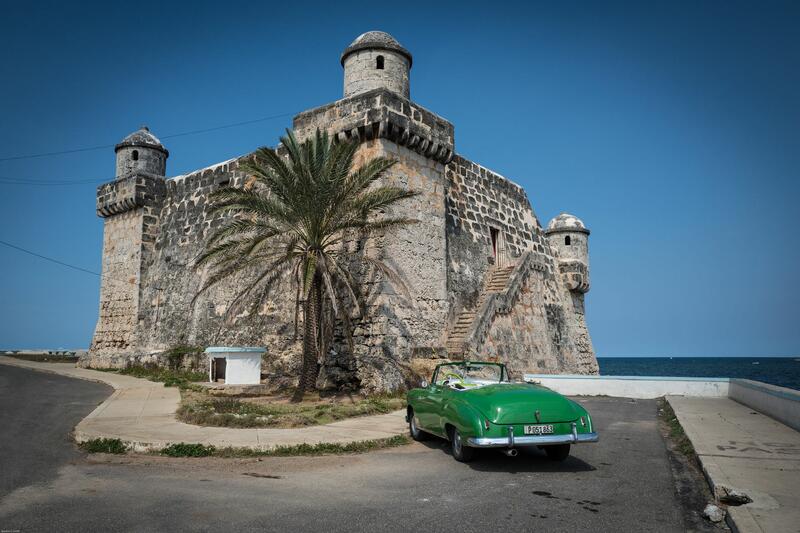 The grandest examples are in Havana. 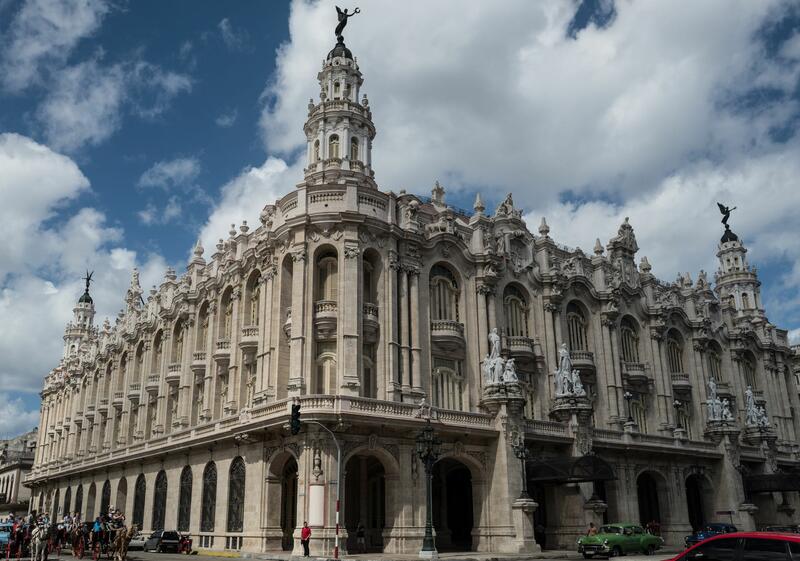 Pictured below is the Gran Teatro de La Habana (National Theater). 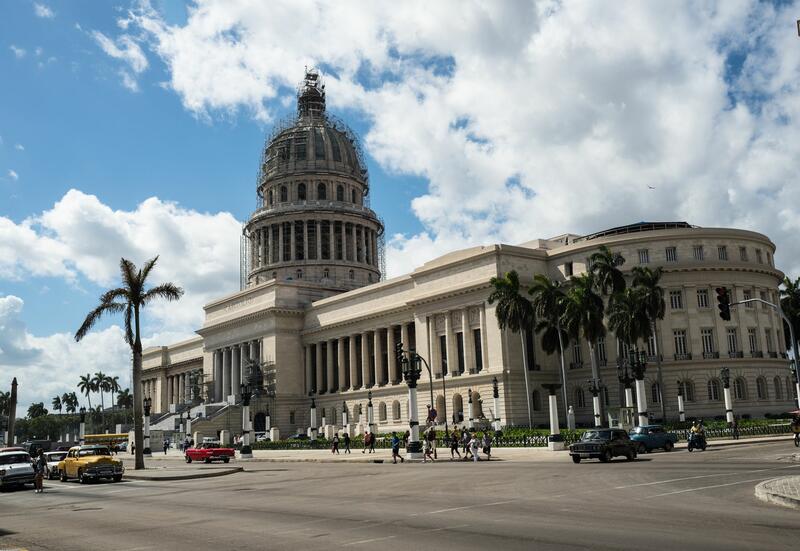 It stands next to the Capitolio Nacional, which looks just like our Capitol. I asked why the scaffolding was around the Capitol dome, and was told that it was a project to raise the height of the dome seven feet, so that it would be taller than the U.S. Capitol. Away from Havana, colonial buildings are often fortress-like or are churches. Sadly, many of these historic buildings have fallen into disrepair. Santiago was the starting point of my tour. 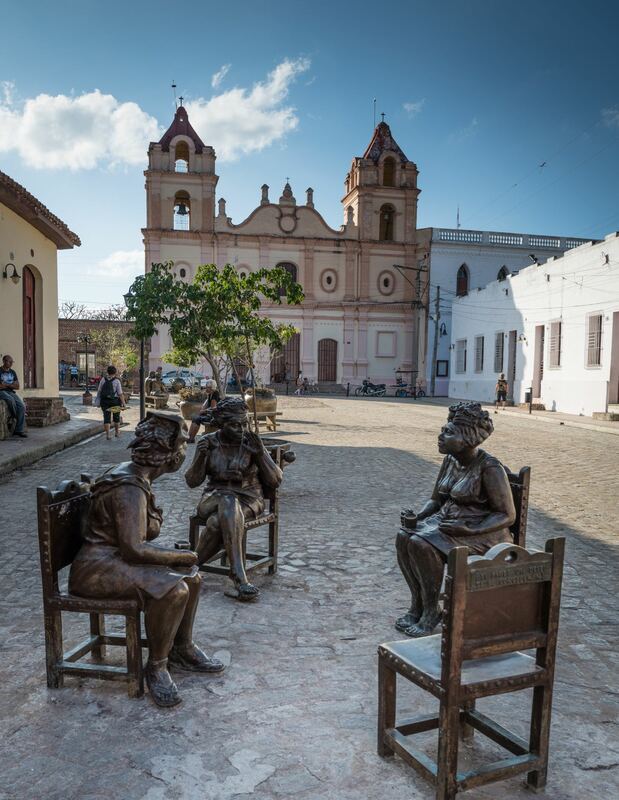 It is Cuba’s second-largest city and has played an important role in Cuban history on many occasions since its founding in 1515. 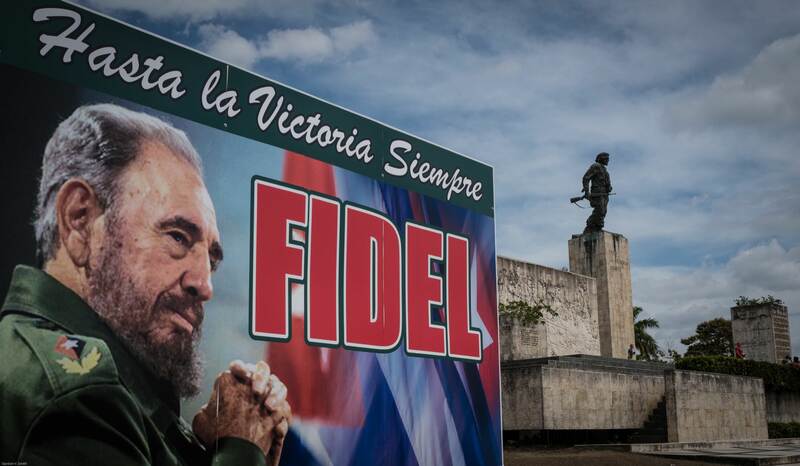 There, and in the surrounding rugged mountains of Sierra Maestra, Fidel Castro launched the Cuban Revolution. His ashes rest there today in the Cementerio Santa Efigenia. Castro’s legacy is much in evidence everywhere. Here, this sign titled “Hasta la Victoria Siempre” (Until Victory, Always) is adjacent to the Ernesto “Che” Guevara museum and memorial in Santa Clara. 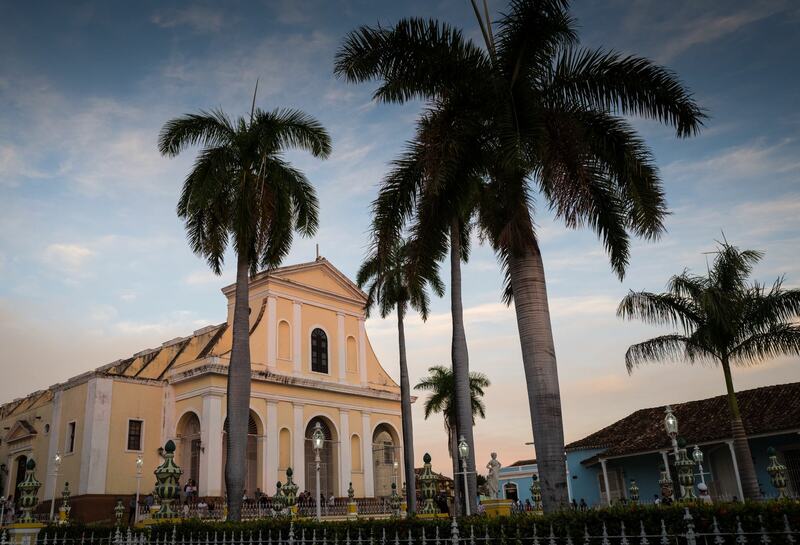 The small city of Trinidad is near Cienfuegos on the south coast. It was founded in 1514, and is designated as a UNESCO World Heritage Site. 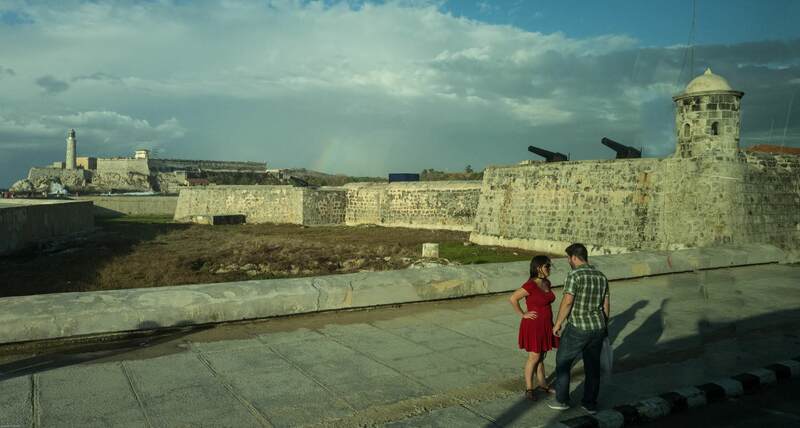 It was once an important port for the sugar trade introduced by the Spanish in 1512. 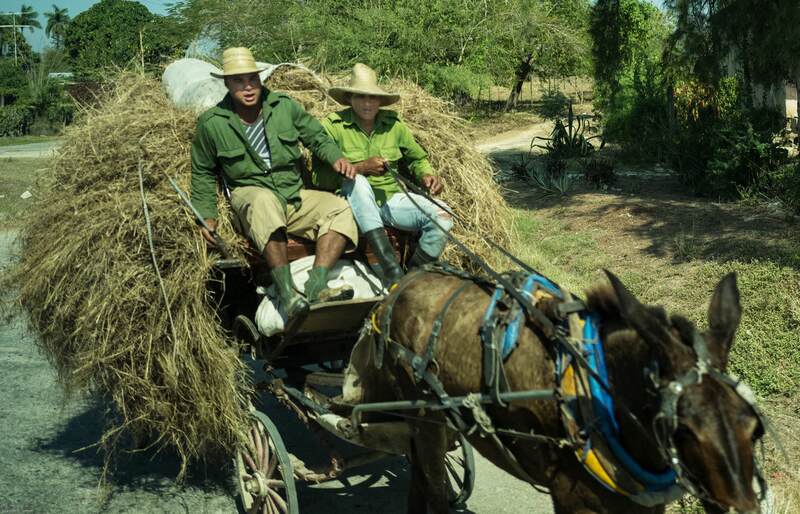 Cuba became a major producer of sugar centered in the Valley de los Ingenios (Valley of the Sugar Mills). The remains of 70 sugar mills surround Trinidad. A special railroad was built to connect these with Trinidad and other port towns. Tobacco and tourism are now the economic mainstay of Trinidad. It is a “must see” location. 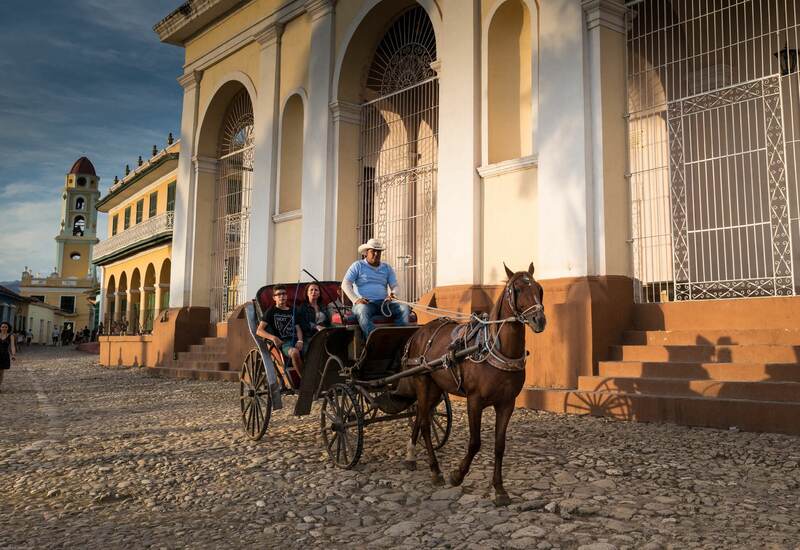 The older section of Trinidad has been preserved and the Plaza Mayor area is a virtual museum of colonial architecture as well as a most pleasant gathering place for music, dining and imbibing. 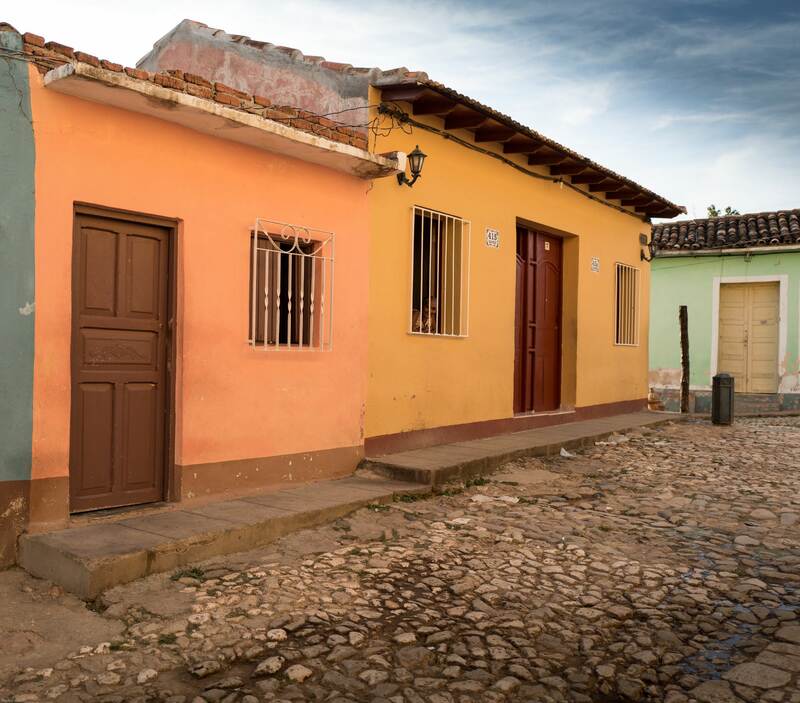 Surrounding the Plaza Mayor is a maze of cobblestone streets and colorful homes. 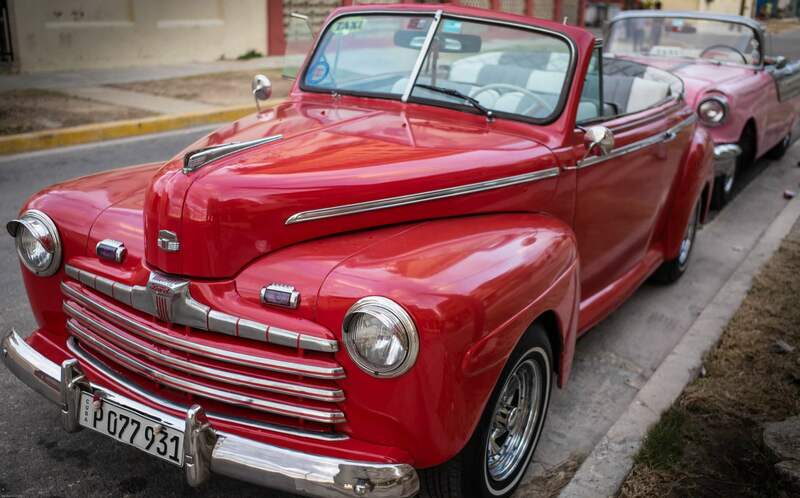 In the United States, one of the most widely-known aspects of Cuba is the iconic collection of American automobiles from the 1950s. In Havana, many of these are for hire to sight-seers. Outside the city they are a means of everyday transportation. Great effort is required to keep them running after all these years. I believe that the government provides some form of accommodation to the owners of the cars for hire in order to maintain them as a tourist attraction. While they are an economic benefit now, they are also a reminder of the economic stagnation of the last five decades that caused these cars to still be in use. I spoke with the owner of this ’41 Ford convertible and told him that it would bring a high price in the U.S. I explained that that model was particularly popular in the 50s and that my generation had “customized” all of the ’41 Fords we could lay our hands on. Hence any of them in anything near original condition is rather rare. I was quite pleased to see a blue and white 1954 Chevrolet Bel Air, identical to my first car, purchased just before my marriage in 1959. Who knows, maybe it was our first car! I expected to see horse drawn vehicles in the countryside, but I had not realized how extensively they serve as public conveyance in the towns, competing for road space with the old cars. In the morning and late afternoon, these taxis are seen gathered at bus stops along the main roads. The paucity of mechanized farm equipment also creates the need for horse-drawn wagons. 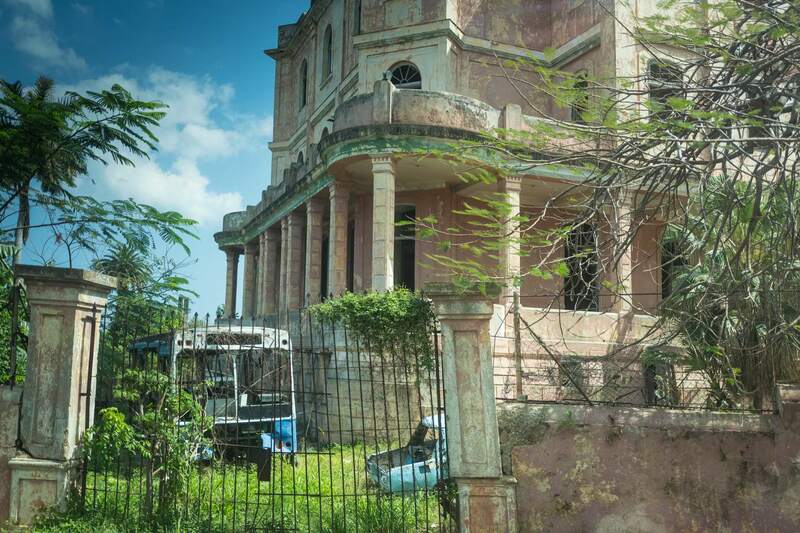 While Cuba’s Spanish heritage is a central thread, the colonial plantations brought in a considerable number of slaves whose West-African culture came with them. Thrown into a new environment dominated by Spanish Roman Catholicism, they practiced a religion now known as Santeria, or Regla de Ocha. 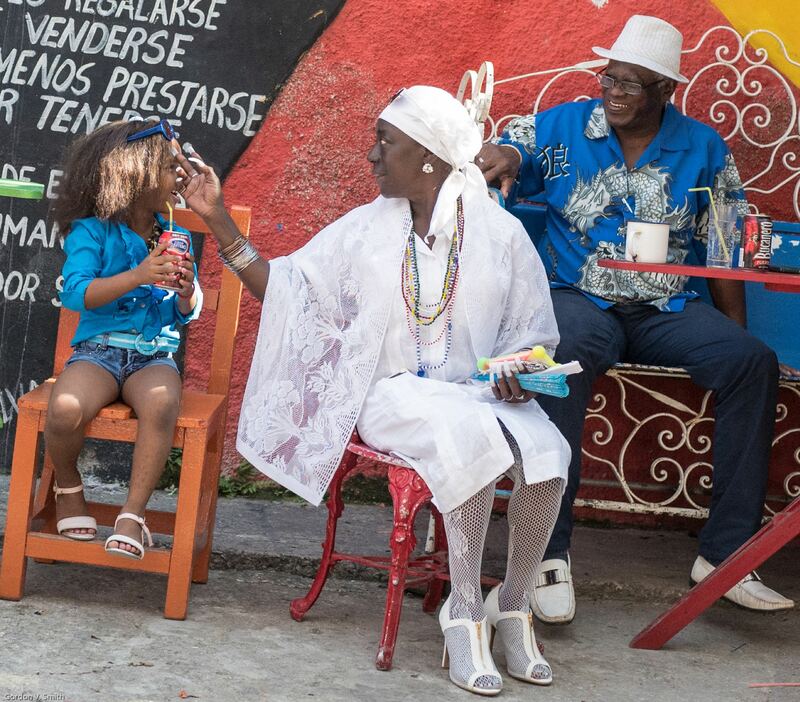 It, and other elements of African culture, have influenced Cuban music and the arts. 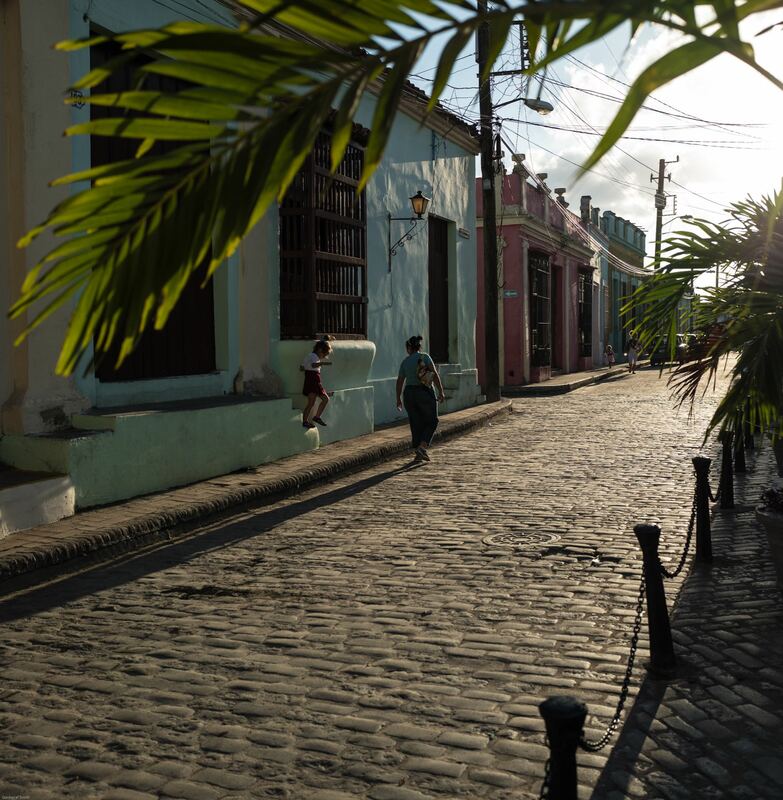 Even though it is a near neighbor, Cuba has been a mystery to us for five decades. Tourism by U.S. citizens, extensive prior to the Revolution in the late 1950s, has been proscribed since the 1961 embargo. The door has been ajar since the 2014 “thaw”, but visitations must conform to specified purposes. Lying on the beach for a week at one of the destination resorts at Varadero, is not one of them…yet. My feeling is that the thaw in our national estrangement will continue, but slowly and unevenly. There are many difficult issues to overcome. I hope, however, that my photographs convey the attractiveness of Cuba and the spirit of its people. You can find more of Gordon V. Smith's photos on his website.